Vancouver-born Eric Migicovsky’s fine-tuned engineering background has made Pebble into one of the pioneers of the smartwatch industry. The company successfully moved from Waterloo to Palo Alto after raising $26 million from various investors. However, this surge of money was not needed for its latest product. New timeline Interface. Review Past, Present, and Future events you care about right from your watch. Initial support includes timeline pins for calendars, sports scores, and weather. Expanded app storage. Goodbye, 8-app limit! 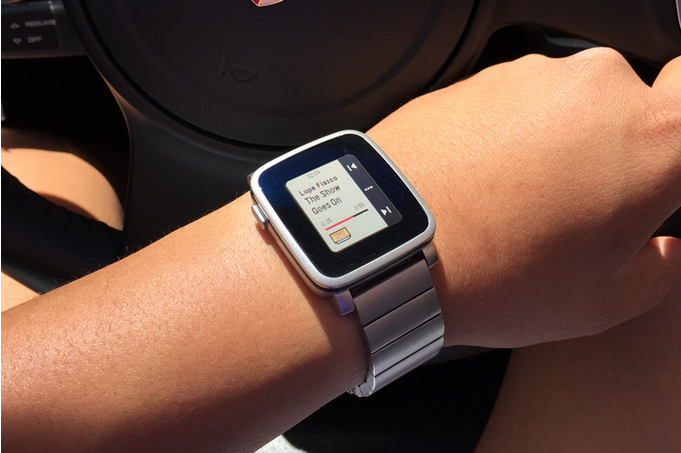 Pebble Time will store as many apps and faces as possible on the watch itself. When needed, an app or face not currently stored will automatically install from your Android or iOS device. New Sports app. Keep tabs on the latest MLB, NBA, NFL, NHL, NCAAF, and NCAAM scores with an official Sports app. Find which teams you want to follow to get start times, score updates, and more sent directly to your timeline. Redesigned system apps in color. Alarms, Calendar, Music, Notifications, Sports, and Settings are all redesigned for Pebble Time’s new color e-paper display. Voice replies to Android notifications. Dictate short replies for app notifications that allow direct text replies. In addition, Pebble teased future updates that include voice response to Gmail notifications on iOS, voice notes app, stocks app, weather watch face, and album art for the music app.